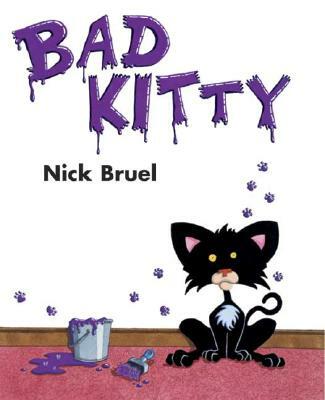 The Bad Kitty books are graphic novels, perfect for a kids who love pictures in their stories. Bad Kitty books are also very good for people who like to laugh. Kitty is really funny, and they just call her Kitty, that’s her name! In the first book, she was being really bad and then she was being good and her owners decided to reward her with a puppy, and that wasn’t a good idea! After that Kitty became even more mischievous. Bad Kitty is a black kitty with a little white fluff in the middle of her chest. She is a troublemaker, a little bit grouchy, and gets into a world of trouble. Find her at your book store or library today! Cheers for this I've been looking for a new book for my lil bro (8)and two cousins (6,7). Sounds like one for them to get into especially my 6 year old cuz she'll lurve it! LOVE the Bad Kitty books. They're great to use in storytimes--adults and kids get the humor. And the longer Bad Kitty books are just as fun. Sounds like a winner. I hope our library orders this one. Great idea to have Junior Correspondent Reviews.